These lovely ladies from the Macmillan Brown Library’s collection are on a float for the Petone Woollen Mill. They’re certainly sporting some stylish woollen threads. The woollen mills opened in 1886 and closed in 1968, at the base of the Korokoro hill. We’re helping Warwick Johnston find information on the mills, for a book he’s writing on their history. 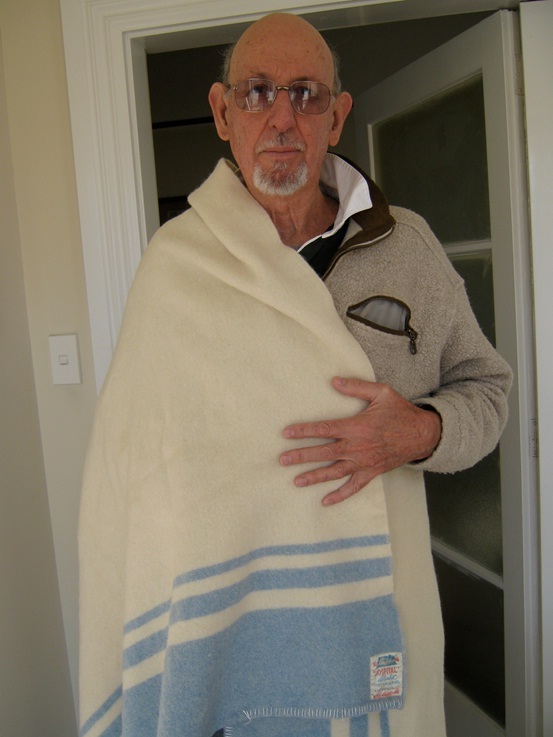 Here’s Warwick modeling a woollen mills hospital blanket. Warwick is a great friend of the Petone Settlers Museum. Longtime resident of Petone, author and historian, several of his books have been published by the museum, and he was a vital contributor to our exhibition Tatau Tatau. Now he’s on the hunt for info about the mills. Did you or your family work there? Do you have any items or artefacts from the mill? Warwick is especially keen on labels from the mill. If you have a blanket lying about in your cupboards we’d love you to email us a photo of its label for his research. Contact me on emma.bugden@huttcity.govt.nz and I’ll put you in touch with Warwick. This entry was posted in PSM and tagged Macmilan Brown Library, Petone Woollen Mill, University of Canterbury, Warwick Johnston. Bookmark the permalink. 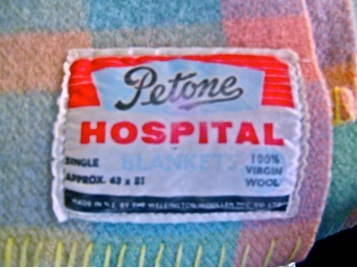 I just picked up a lovely apricot and gray plaid Petone Hospital blanket complete with label at our local Goodwill Thrift Store for $9.00. I’d be happy to send a photo of the label if interested.